Well, that’s how it feels, anyway. Me and my mini-garden; in my hand, microscopic carrots, beside me, tomatoes and behind, a couple of confused cucumbers (they can't figure out how to climb). My tiny sidewalk garden is growing: a couple of cuke plants, tomatoes just a few weeks old that already need transplanting yet again, a gaggle of miniscule carrot tops and a windowbox of mesclun-style greens. 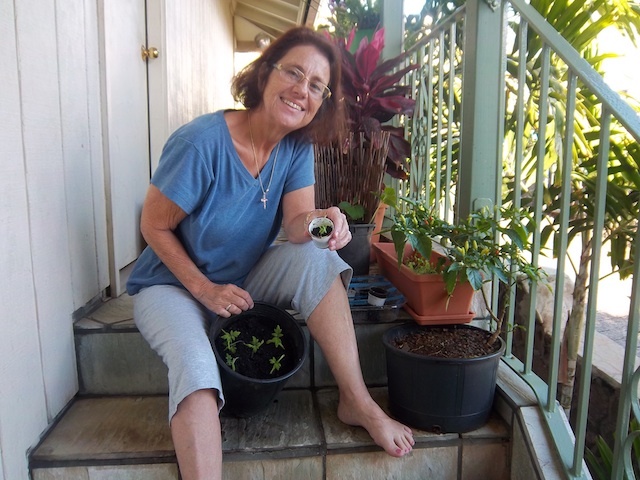 Got some worm poop from Waikiki Worms (they’re closing their King Street location and there’s a super sale on until the end of March; consider vermiculture/composting for an earth friendly way to make your own rich soil amendments; see my story in The Honolulu Weekly from three weeks ago). Going out to buy pots and yet more soil. The carrots will go into my cousin’s dandy water-fed bucket gardening system once I get the thing put together. I cannot wait to eat something I’ve grown. It’s been years since I gardened other than a couple of dwarf fruit trees and some herbs. The feeling is as gratifying as I’m sure the eating will be. On the other hand, they are somewhat like children, or at least pets: Every time you turn around, they’re in need of something — watering, transplanting, thinning, topping, an encouraging word. Some of the greens in my windowbox; they'll have to be thinned. Just like kids; it's always something. Alas! 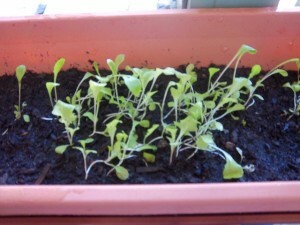 My Venetian arugula didn’t sprout at all. The seed must not be viable, though I think I’ll try again with the seed I have left. Roasted carrots — Wash and peel 3-4 fresh, medium carrots. Slice and cut into precise little squares (maybe 1/3 inch on a side or slightly larger). In a bowl, toss carrots with 1 tablespoon olive oil or melted butter (I prefer the latter), 1 tablespoon brown sugar and a sprinkling of sea salt. Add snipped fresh herbs, if you like (dill is customary). Arrange the carrots in a rimmed baking pan lined with nonstick foil (Reynolds Release or like that) and bake at 450 degrees until the carrots are tender and slightly caramelized. Stir or turn them once or twice during cooking to color evenly. While you’re not using much fat, salt and sugar, there’s just enough to form a lovely glaze. I learned this from a cooking student at KCC who invented the recipe using butternut squash for her mother who was trying to eat more healthily. Wish I could recall her name. But this crazy simple recipe stood out among a number in a food competition I judged precisely because it was straightforward and the flavors so clean. You could take a similar approach with potatoes but without the brown sugar; I like olive oil and minced parsley and garlic. Gardening is TOTALLY rewarding, whether it’s just a few herbs or a full-blown salad bowl of garden greens. I grow my own Manoa and Anuenue lettuce (letting a few go to seed to reseed themselves in the garden plot), wild arugula (not susceptible to white rust, a fungus in my soil), mizuna, flat leaf parsley, beets, and several types of kale. So yummy and so very satisfying to grow one’s own food!